Leighton Ford was an associate evangelist for the Billy Graham Evangelistic Association for 30 years and observed the growth of Billy Graham’s international ministry firsthand. He went on to chair the Lausanne Committee for World Evangelization and to found Leighton Ford Ministries, which focuses on developing the next generation of leaders. Dr. Ford’s wife, Jean, is Billy Graham’s younger sister. Matt Forster asked Dr. Ford how he saw Billy Graham grow in international ministry over the years. 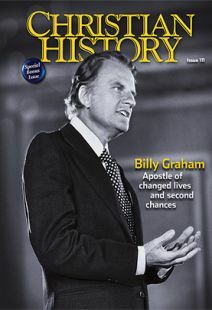 IN THE LATE 1960s﻿, I was speaking at Duke Divinity School’s chapel when someone asked me, “How have you seen Billy Graham’s mind change across the years?” The image of an arrow came to me. Billy Graham has been like an arrowhead—sharp at the point, broad at the base, and with a deep shaft. The point has always been the gospel, always Christ—whether he’s speaking to a great stadium or university group or a group of scientists or whatever. Like the base of an arrowhead, the implications of his gospel broadened through the years: in terms of racial justice and poverty, in terms of relationships between churches and nations, in terms of nuclear war. Then, like the shaft of an arrow, he kept going deep—deep into the Word, deep into God. His early days with Youth for Christ after the war took him to England. His early preaching and making contacts there broadened him beyond the United States. That time in England was very important, and during the 1954 Harringay crusade in London, he became an Anglophile. He loved the Anglican Church. I wouldn’t be surprised if parts of his Baptist heart had bits of Anglican in it. Billy learned through people. Jack Dain, for example, was very important in his life. Jack had been a missionary in Pakistan. He had led the India-focused Bible and Medical Missionary Fellowship. He had been a missions leader and bishop in Australia. And Billy certainly learned a lot from him about India and Asia. His friend Don Hoke, whom he knew from college days at Wheaton and who had been a missionary in Japan, was a great help to him on matters relating to Asia. Robert Evans, who founded Greater Europe Mission, a friend from Youth for Christ days, informed him about what was going on in Europe. In the United Kingdom, there was John Stott and also Arthur Goodwin Hudson and Hugh Gough, both of whom went on to be bishops in Australia. There was Billy Kim in Korea and Peter Schneider in Germany. He relied a great deal on these friends and the fact that they lived in and knew well these places. I also think dealing with the press was very important. Going to a London pub in 1954 and sitting down with one of the best-known columnists of the day and taking questions was a very important learning experience. Billy’s curiosity, his willingness to ask questions, to be humble, and learn from others was very typical of him. He was trained in anthropology and Bible. His uptake on cultural things was pretty savvy. A pattern developed in the international crusades that an associate evangelist—such as myself—would go to a city or country ahead of time and preach for a week or two at the same venues. Then Billy would come and, of course, crowds would explode when he came on the scene. We did that in Latin America; we did it in Africa; I did it in parts of French-speaking Europe. It wasn’t just Billy dropping in for two or three days. His preaching was part of a longer and deeper outreach. People who were there ahead of time would send him a briefing book to give him background on the country, the city, the leadership, and so forth. Often that would come from his crusade directors. We had some interesting experiences. In Accra, Ghana, they told us, “Don’t give the same invitation you give in North America, because if you ask people to come forward, everybody will come. They want to see the evangelist from overseas. So he learned and changed his approach for the rest of the meetings. Matt Forster is a journalist in Clarkston, Michigan.